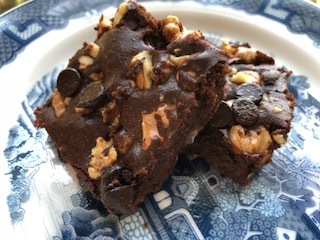 If you miss fudgy, nutty, chocolatey brownies, I’ve got you with this recipe! I’ll be honest, I made them exactly 4 times in 4 days a week ago. 2 times for our family and 2 for functions I attended. I’ll keep on with the honesty, I actually grabbed 2 right off the bat each time to be sure I got my share before they were devoured. And they were devoured. Every. Single. Time. Pair this decadence with coffee, and you may just melt into a puddle of thankfulness. The fact that it’s sugar free and crazy low carb is just icing on the brownie! They also take 7 minutes to prepare. That’s not a typo, I’m busy and I want to know how long the prep time actually is, and I’m telling you, after my 4th time I can’t seem to get it under 7 but it’s less than 10! 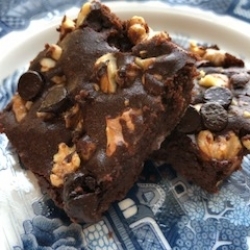 Inspiration for this recipe came from ketodietcafe, total props to them for a great base recipe! Enough chit chat, time to make a grocery run and get these babies in the oven! Melt chocolate and butter in a sauce pan on medium low heat. While that’s melting, combine salt, cacao powder and coconut flour in a small bowl and set aside. Blend eggs, almond extract, and monk fruit in a bowl for about 3 minutes or until it triples in size. With a spatula, blend chocolate/butter mixture into the egg mixture, then fold in flour mixture. Pour into an 8×8 pan and cook for 30 minutes. If you’re alone, they won’t even make it to a plate, so at least grab a fork for goodness sake! Enjoy warm on it’s own or top with a scoop vanilla Halo Top ice cream.